More consumers are moving toward plant-based products. This trend reflects an increasing focus on health, wellness, food safety and diet, as well as concerns about animal welfare and environmental sustainability. While mainstream acceptance of plant-based products remains on the horizon, industry players have an immediate opportunity to drive further adoption and identify categories still ripe for disruption. Yes, the grocery aisle is getting greener. Consumers — fueled by a host of concerns, including health and wellness, food safety, environmental sustainability and animal welfare, and adopting restrictive diets due to food sensitivity worries and more general lifestyle choices — are increasingly choosing plant-based food products. But while the appetite for plant-based products is vast and the sector is already experiencing notable growth, it’s still early days. The market remains difficult to size, and there are a number of challenges that need to be addressed before its value can be fully unlocked. They include consumer dissatisfaction with taste and texture, concerns over nutritional content and excessive processing, and legal and regulatory classification challenges. Plant-based products manufacturers, retailers, distributors and investors can address those challenges to drive even greater adoption of plant-based alternatives. In the meantime, there remains an ideal window for identifying future categories still ripe for plant-based disruption. There are myriad reasons why more and more consumers are moving toward plant-based products, with health and wellness topping the list (see Figure 1). Consumer focus on health and wellness. Concerns over health have led many consumers to a greater appreciation of plant proteins, which provide more nutritional value from fiber, healthy fats, and vitamins and minerals than that derived from animal proteins. Indeed, medical studies have linked the consumption of animal fat/protein to the development of chronic degenerative diseases. Increasing food safety concerns. Growing worries about food safety related to the use of hormones and antibiotics in meat and dairy products are prompting consumers to increasingly supplement their diets with plant-based options. Growing concern for animal welfare. Animal welfare, long a core reason for choosing plant-based foods, continues to play a role as more consumers have become sensitive to the conditions in which animals are raised and harvested. Meanwhile, animal welfare requirements aimed at reducing such suffering can drive up costs, which is causing some consumers to seek less-expensive alternatives in the form of plant-based products. Increased awareness of environmental sustainability. As awareness grows around the massive amount of land, food, energy and water required to raise animals for human consumption, some consumers are becoming concerned about environmental sustainability. Gen X and millennial consumers — the largest drivers of discretionary spending in the U.S. — in particular are seeking increased transparency about how the food they consume is sourced, especially as it becomes clear that an animal-based diet is not sufficient to meet the protein demands of a growing world population. What they’re learning is leading many of them to seek plant-based alternatives, even though some of those products are themselves taxing on the environment. Take almond milk: It requires 1.1 gallons of water to grow a single almond. Rising prevalence of restrictive diets. More than half (roughly 51%) of Americans have adopted a restrictive diet that focuses on increased consumption of plant-based products. While some of these diets are driven by food allergies or intolerances, others, such as paleo and flexitarian diets, are lifestyle choices aimed at achieving greater well-being. Sales of plant-based products currently account for 1%-2% of total sales in most categories, such as meat, cheese and yogurt, though plant-based milk comprises approximately 9% of total milk sales. However, L.E.K. Consulting estimates that the market for plant-based substitutes and alternatives was approximately $5 billion in 2017, an increase of approximately 8% over the previous year, according to various sources (e.g., SPINS, Nielsen). 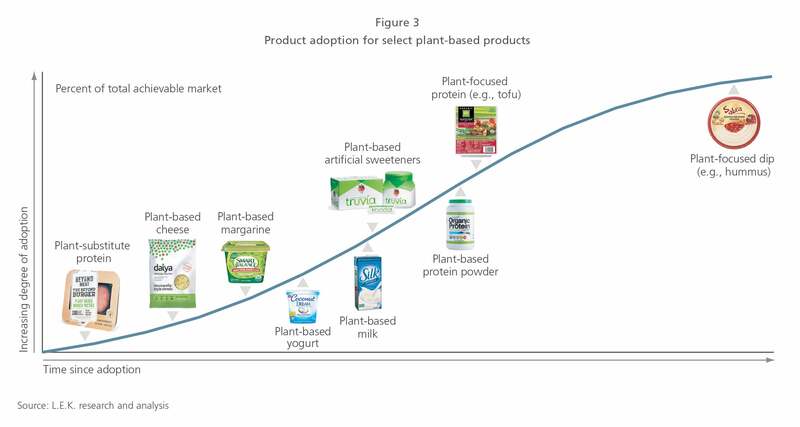 There was also a flurry of M&A and related activity in 2017 as companies sought increased exposure to the fast-growing plant-based products market and moved to expand their product offerings in an attempt to meet consumer demand (see Figure 2). 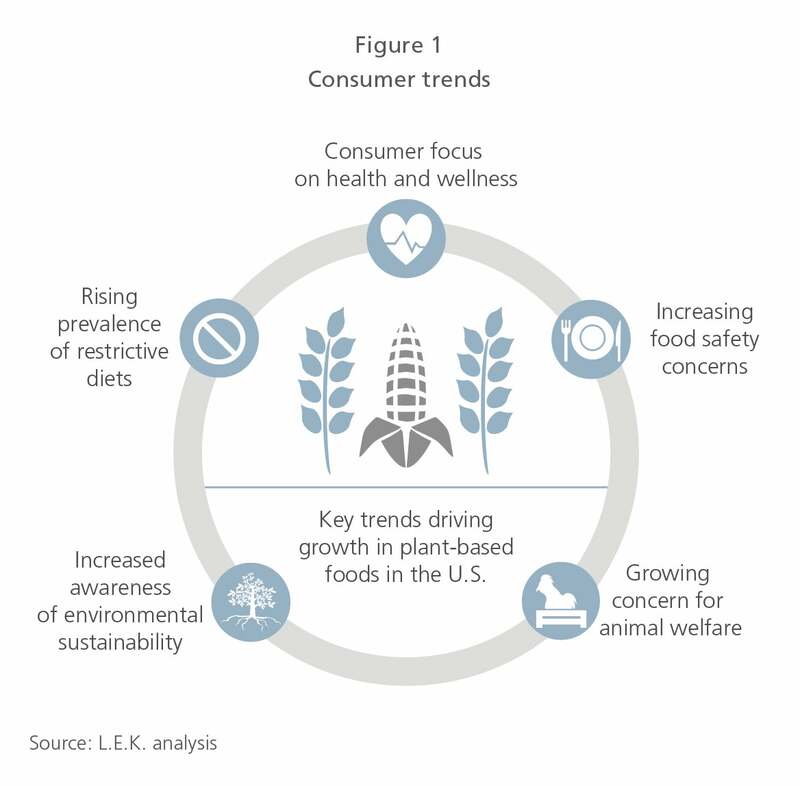 Despite the challenges, plant-based food continues to gain popularity among consumers (see Figure 3). To drive even greater adoption, manufacturers, retailers, distributors and investors can invest in more product development and innovation. How quickly the plant-based food category grows will depend on how quickly, and effectively, the following steps are taken. Improve the taste and/or sensory experience of plant-based products. Many consumers feel that plant-based alternatives are pale imitations of their animal-based counterparts, lacking in taste or satisfying texture. The barrier is especially high when it comes to replicating the experience of eating meat. To that end, manufacturers of plant-based meat alternatives, such as Beyond Meat and Impossible Foods, have made significant progress. Beyond Meat, for example, uses a combination of beet powder and annatto to replicate the “bleeding” commonly associated with burgers; Impossible Foods uses soy leghemoglobin, which contains heme, an iron-rich molecule found in red meat. Ensure comparable nutritional content. Plant-based products lack the nutritional content found in their animal-based counterpart products, in particular when it comes to protein, vitamin B12, omega-3 fatty acids, vitamin D, zinc and iron. For example, cow’s milk contains 8.2 grams of protein per serving while soy milk contains 4–6 grams, hemp milk has 2–3 grams, almond milk has 1 gram and coconut milk has none. The majority of plant-based proteins are also not complete as they do not provide all essential and nonessential amino acids. Enhancing plant-based offerings to ensure comparable nutritional content can help address this gap. Minimize processing. Certain plant-based foods are highly processed, which leads consumers to question their health benefits. This can be especially true in the case of plant-based dairy alternatives, some of which, critics note, need to have extensive amounts of oil and fats added in order to replicate the taste of their animal-based counterparts. Finding ways to minimize the amount of processing involved in plant-based products will increase their consumer appeal. Come up with acceptable labels. From a marketing standpoint, plant-based alternatives face growing legal and regulatory scrutiny as industry associations try to prevent them from using classification terms that assist with consumer adoption. The European Court of Justice in June 2017 ruled that plant-based products can’t be described using dairy terms such as “milk” or “butter,” even when their plant-based origins are clearly labeled. In the U.S., a bill to prevent plant-based foods from using the dairy labels was introduced in the Senate at the start of 2017 titled the “Dairy Pride Act” but then subsequently was referred to the Committee on Health, Education, Labor, and Pensions. While the bill has not been ratified by the Senate Committee, the dairy industry is pushing hard to get it passed. Coming up with classification terms that resonate with consumers without provoking trade groups will go a long way toward facilitating the acceptance of plant-based foods. Although it can feel like plant-based products are everywhere, in fact the plant-based products industry is still a burgeoning one relative to the overall food and beverage market. This means that while mainstream acceptance of plant-based products remains on the horizon, manufacturers, retailers, distributors and investors need to address consumers’ concerns over quality and nutritional value along with regulatory hurdles such as labeling. In addition, there remain a number of categories — such as new cuts of meat, seafood and savory snacks — in which there has been limited penetration to date. With plant-based products, today’s challenges present tomorrow’s opportunities.